Tumor deposits (TD) are irregular discrete tumor masses in adipose tissue, discontinuous from the primary tumor, that are described in various cancers. The incidence and/or prognostic value of TD in breast carcinomas have not been studied so far. We reevaluated 145 breast cancer patients, diagnosed and treated between 2001 and 2006 at our institution for the presence and incidence of TD. Histologic type, grade, size of the primary tumor, estrogen receptor, progesterone receptor, human epidermal growth factor receptor-2 status of the tumor, and presence of peritumoral lymphovascular invasion were included in the data. TD were detected in 42 cases (29.0%). The mean age of the patients was 52.2 years (27–82). Most patients (79.3%) had either invasive carcinoma of no special type (NST) or invasive lobular carcinoma, and most tumors (86.9%) were either grade 2 or 3. After excluding TD from the number of metastatic lymph nodes, the pN status of 9 patients changed. 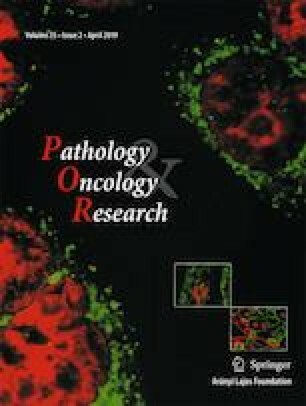 Univariate analysis of 110 patients with follow-up information revealed that the new pN status (p = 0.036), presence of local recurrence (p = 0.016) and TD (p = 0.003) were significantly correlated with distant metastases. The median follow-up of the patients was 84 months (5–161), 10-year disease-free survival and overall survival were 67.2% and 73.7%, respectively. In multivariate analysis, presence of TD remained independently associated with distant metastasis (p = 0.002). The probability of distant metastasis was 3.3 times higher in patients with TD. These results emphasize that TD are present in breast cancer patients, and that their presence should warn the clinician in terms of possible distant metastasis. Therefore, presence of TD, the evaluation of which is neither time consuming nor require sophisticated methods, should be included in pathology reports.